Ein Studio-Apartment für max. 3 nahe am Strand und zum besten 5Terre Spaziergang. Ein Studio ideal für ein Paar oder 2 Freunde oder für eine 3-köpfige Familie. Es hat ein Doppelbett, ein kleines Klappbett, Küche und Bad und ein Fenster mit Meerblick. Es hat eine private Terrasse im Freien, wo Sie sitzen und lesen oder sich in der Sonne sonnen können. Der Garten ist draußen und unter dem Gebäude. Es ist sehr nahe am Zentrum der Stadt, mit Cafés und Restaurants, und auf dem Weg zum schönen Marina von Corniglia. Einer der besten Felsstrände der Cinque Terre, mit vielen flachen Felsen zum Sonnen und leichten Zugang zum Schwimmen ins Meer. Der Yachthafen verfügt über einen Seekajak-Verleih und eine Süßwasserdusche. Das Studio ist sehr leicht vom Stadtzentrum, Bars und Restaurants, Lebensmittelgeschäften und dem Bahnhof zu erreichen. Fabio, der in den USA geborene Besitzer, wird in seiner Karriere als einer der Planer des Cinque Terre Parks in der Lage sein, Ihnen alle Informationen zu geben, die Sie für den Besuch der Gegend benötigen. Batroom hat Dusche, Toilette und Bidet. Beautiful spot, Great apartment, Fabio was the best! As a new traveler the owner helped me through out my stay and referred me to other areas through out my 2 week trip to Italy. Just a great guy! The apartment was very nice, quiet, close to the center of town. I will be back. Nice property in a beautiful location! Small but cozy apartment in wonderful location! Beautiful view. Fabio is great with communication, very easy to deal with. Gave us great info on the area, too. Highly recommend this place. We loved Corniglia because it was small and not crowded. The apartment view was enchanting. We are already planning our next visit. The only suggestion I would make is to get softer pillows. Minor issue for how wonderful it was. 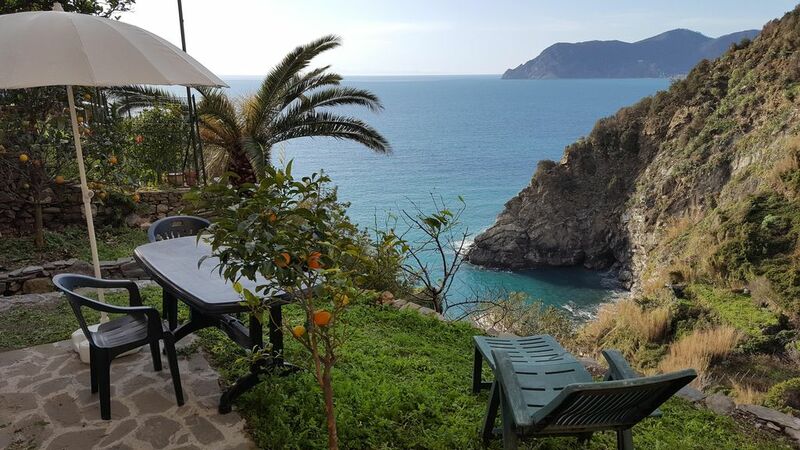 Great studio with beautiful view of the water in beautiful Corniglia(the best of the 5T in my opinion). Fabio provided step by step directions to get to the room and great recommendations for enjoying the cinque terre. Would have given 5 stars, but there is a slight basement like/musty smell to the room. We kept the door open when in the room for the fresh air. Otherwise, perfect place for our two night stay! We loved our little home away from home! It started with great communication with Fabio. Very clear instructions from how to find their place to suggestions on various hikes. Included is a great little kitchen space with all that you need for preparing meals if you want. There’s room to move around for two people comfortably. The bed was comfortable and you feel very little movement from your partner. The tap water in all of Italy is drinkable so that was convenient as you need a lot of it! Corniglia is a great village to stay in, especially in the evening to get away from the crowds. At Fabio’s you have your own little garden to relax in and soak up the view and the sunsets. We really loved it here and Fabio’s set up is easy and comfortable! I’d highly recommend it!!! The only thing that would have made it better is if we could have met our hosts in person! Garbage needs to be taken in the recycling bins in the Piazza; where the bus stops, the evening before checking out. Guests must send before checking in Passport data of one person, and name birthday and birtplace of all other guets, It is a police and tourism requirement in Italy.